Customer Complaints - Ansera d.o.o. TIBCO Spotfire® and the use of the OData connector enable the analysis of data recorded in SharePoint. Companies want satisfied customers. Keeping them is a guarantee for business growth and profit. Therefore, monitoring and resolving any complaints is of particular importance. Bad days happen to anyone. It is important that we know what we did wrong and to react quickly and effectively! Resolving complaints is a very demanding and sensitive issue for each company. It is essential that we always have a systematic overview of all customer complaints, as well as an insight into the details of each of them. For effective resolution it is necessary to define activities, responsible persons, deadlines and the implementation to be monitored on a daily basis. In this way, we will be able to understand every complaint as an opportunity for improvement. In several cases companies se Sharepoint to enter all information about complaints. Sometimes ERP system have TQM modules but they do not meet specific requirements of individual companies or they are not implemented by companies because of their complexity and high prices. They prefer solutions like SharePoint, which enable fast deployment and maximum flexibility. After that they need a system for analyzing this data source. 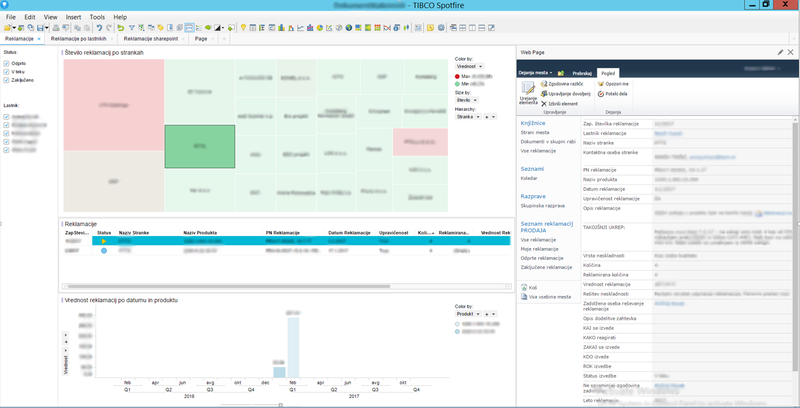 In this case, we can use TIBCO Spotfire® solutions and its OData connector to display data from SharePoint. 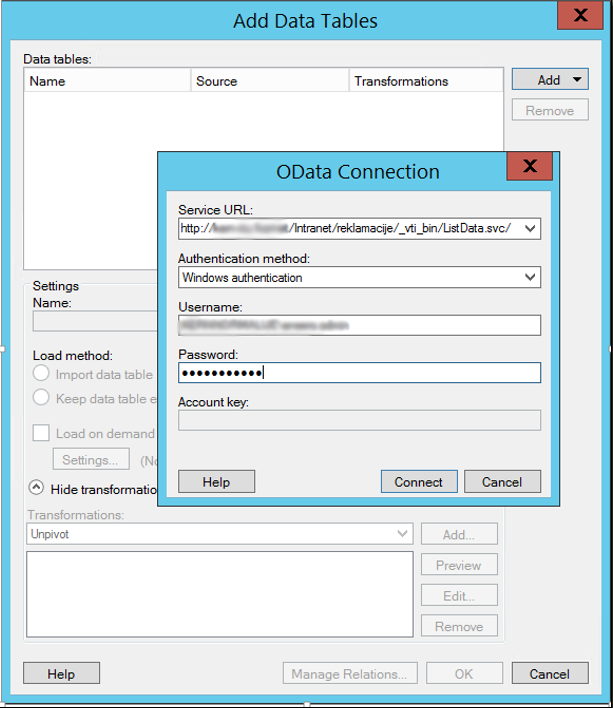 First we create connection to SharePoint with OData connector. Then we prepare a customer complaint analysis in TIBCO Spotfire®. By choosing colors and sizes, we immediately see which customers have the highest number of complaints or highest value. For example, the size of the rectangle represents the number of complaints, and the color signals their value for each customer. By choosing a customer (clicking on a single rectangle) we gain insight into individual customer complaints. It is essential that the user can view all information and details in one environment. Spotfire® also allows browsing of websites within its own environment. The display of a particular page is relatively simple, since it is meant to click on the “http” icon and the entry of the desired URL in the dialog box. 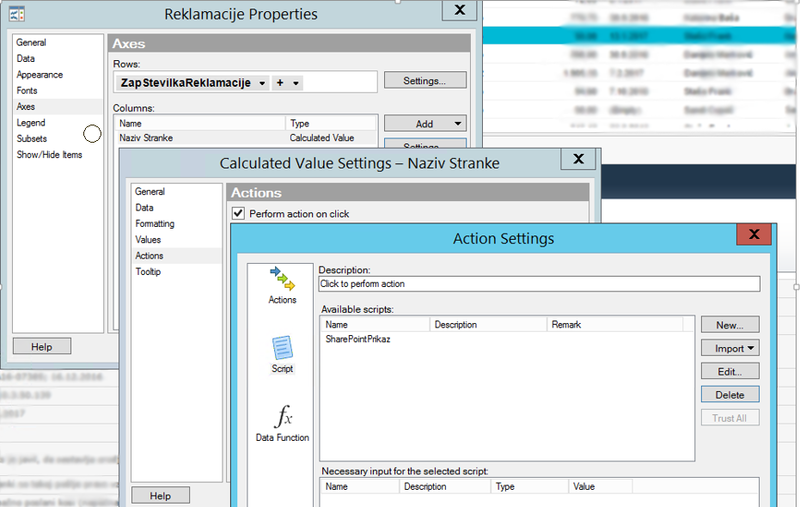 This allows the user to inspect the contents of the SharePoint site within the Spotfire® window, so there is no need to switch between different programs (such as Spotfire® and the web browser), which greatly facilitates work. In this case, we also want to interact with clicks in Spotfire® visualizations and a web address in the Configure Web Page Panel dialog box. This can be accomplished with the Iron Python script, which, as a URL, in the dialog box for displaying a web page, imposes the value of the Hyperlink column from the data table called ReklamacijeInUkrepi and the toolbox defined by the RekID marking. Thus, in Spotfire®, we have a complaint analysis with all the details entered by users on the SharePoint list, including text descriptions that are important at the level of individual complaints, but less important for general overview of customer complaints. Ansera, business and financial consulting, Ltd.
© 2019 Ansera Ltd. All Rights Reserved.